I was hired to do all of the production for the show and it was at the Mabee Center in Tulsa, Oklahoma. The Mabee Center is a large venue on the Oral Roberts University Campus. It's where Elvis used to play when he came to Tulsa. I did all the lighting and all the sound for the show. My band was the opening act and also played as Mr. Berry's band. The CD comes with a ten-minute excerpt from Berry's performance. 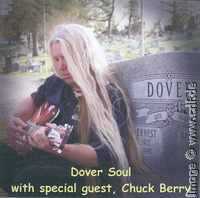 Though titled "Johnny B. Goode" on Dover's CD, you hear the complete closing segment of the show. First Berry performs his best-known song, then he continues with his usual closing routine asking for girls to dance on stage while Berry and the band run through a variant of what was once published as "House Lights" on the 1979 Rockit album. I asked David Dover how he came to record the Berry show and more importantly how he got Berry's permission for that. I told Mr. Berry that I was going to record and he had no objections so I proceeded to do so. 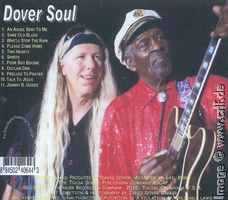 I recorded the entire show but Johnny B. Goode was the best of the bunch so that is the one I included on my album. In contrast to a hundred of audience recordings made from Berry shows over the last decades, here we have a recording that is at least technically very good. Musically it is what you expect from an eighty-year old rock'n'roller. The backup band is better than most of the local pickup bands Berry uses when on the road, though not as good as the family line-up he plays with in St. Louis. When you look at a short video recording from this show, you see that Berry's friend, tour manager and bass player Jim Marsala was present on stage and guiding the band as he usually does. The album is available from most of the large Internet shops. Click here for some links. The CD looks quite handmade. Even though I received a sealed copy through amazon, the disk is just a burned CD, not a pressed one. Likewise the cover seems to be made with a home printer. Song titles and running times are printed onto the CD only. Just like the recording information also writer credits are missing. I'm pretty sure that Dover did not write Who'll Stop the Rain by himself. You can listen to an excerpt from Johnny B. Goode here or use the link to purchase the entire audio file. I have a publishing company and I own my own label so I suppose it would be considered an Indie label. I have the neccessary gear to produce a CD of good quality. A also have a Sony machine that mass produces them, so basically I am my own record company. I also own a shrink wrap machine to wrap the CDs. I have everything the big companies have except the money to promote myself. Right you are, David. Therefore here's the place for me to promote your album. Recommended! In addition David listed the following musicians as playing the Mabee Center concert: David Dover (guitar and vocals), Rick Heck (drums), Dave Russell (sax and vocals), Chip Anderson (bass and vocals), Rick Morrow (piano and vocals), Ricky Paul (guitar). Thanks to Morten Reff and David Dover for help with this blog article.